“How are the kids doing?” is a wellbeing question. Many adults might be able to answer the question for their own children or those in their immediate surroundings, and many children may provide information about their own wellbeing or those of other children. However, applied to large populations of children at the national and cross-nationallevels, questions of this genre are more challenging and have stimulated the rapid development of studies of child wellbeing in recent decades. 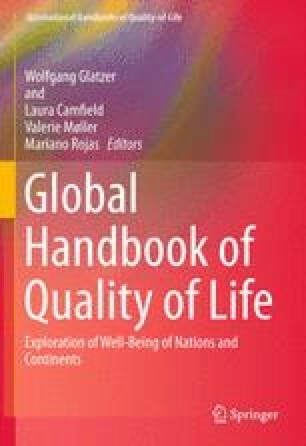 This chapter reviews the objective and subjective approaches to measuring child wellbeing, describes the roots of this field in the social indicators movement of the 1960s and 1970s, outlines the conceptual and methodological development of child wellbeing research, and summarizes empirical findings from several major national and cross-nationalstudies of child wellbeing. The chapter concludes with future directions and needed conceptual and data developments to advance the global monitoring of child wellbeing.